My sister and I took the Harbor Express ferry to George's Island in Boston Harbor. The ferry covers the five mile trip in just twenty minutes. At twenty knots it is a fast and fun ride. It was much cooler on the Island than in town. Lots of people were sunbathing, eating picnics, and in general having a good time. In peak season the boats leave every half hour on the weekend from Long Wharf. We did not visit the civil war era Fort Warren, where at one point the vice president of the confederacy was held. Some of Harvard University's libraries have exhibits that are open to the public. At Pusey Library all that was required to enter the exhibit areas, was to read some rules, show a picture ID, and fill out some basic personal information. They have an extensive theater collection. On display were small original fliers for such musicals as: Kiss me Kate, Oklahoma, Annie Get Your Gun, South Pacific, Carousel etc. There was a small padded bench in a small room with posters on the walls and the music playing from some of the musicals. It almost seemed a little camp. It must take tremendous effort to mount these exhibits. I hope that many people come to admire them. On the other end of the hallway is the Theodore Roosevelt collection. Just as with the theater collection, they rotate the exhibits. This time political cartoons about his presidency were featured. Over lunch a historian had pointed out to me that Theodore Roosevelt was criticized by the Republican Party for not being pro business enough. Some of the cartoons confirmed this. Looking at original documents is such an interesting way to learn about history. After touring the Adams National Historical Site I took a free trolley to the ferry back to Boston. When I arrived at the dock area, I had an hour before the boat departed. So for $5 I toured the USS Salem , which was a destroyer commissioned in 1943 and launched in 1947. The top deck was in pretty bad repair and I began to wonder what I was doing there. Then I went down to the deck below, and it was there that they had made it into a museum, with a wide assortment of rooms with period artifacts. There was a barber shop, a rec hall for movies, an operating room, an electrical room, a machine shop etc. The ship must mean a tremendous amount to local veterans of the navy and the marines. There were some volunteers on board who looked as if they had been in the service. The ferry from Quincy to Boston costs $6 one way. It was fast and a lot more pleasant than my train ride to Quincy from Boston this morning. Exactly one hundred eighty years ago today John Adams and Thomas Jefferson died, July Fourth, 1826. Today I visited the birthplace of John Adams as well as the birthplace of his son, John Quincy Adams, the second and sixth presidents of the United States respectively. Both father and son had limited social graces and were elected to single terms. John Quincy Adams served in the House of Representatives after his presidency, until he died. The wives of both men were infinitely more socially poised, as well as being intelligent and talented. The correspondence between John and Abigail Adams has now been made famous in books and documentaries. The historian James McCullough did much to rehabilitate the reputation of our nation's second president. 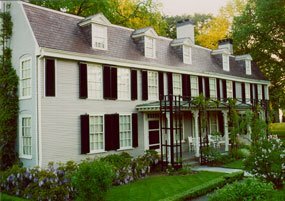 Besides the birthplaces which seem very humble by today's standards, the tour also included the house that the John and Abigail purchased in 1788. Abigail had bought it based on a childhood memory of the parlor. The purchase was made when they were living abroad. It was in a terrible state of disrepair when she arrived with beautiful furnishings from Europe with which to decorate. It took fourteen years to fix it up to her liking. Four generations lived in the house and it was their great grandson who married a very wealthy woman and spent the money to make it look really grand. Realizing that he had no heirs to live there when he died, he convinced relatives to return objects that had originally been in the house so that it could be opened up to the public. Virtually everything in the house is original to the four generations of Adamses who lived there. This is very rare in a historic house. The guide for the big house did an exceptional job. He started the tour by telling us that his ancestors came to New England in 1650. He knew a lot of detailed information about the house and its inhabitants. I was on the first tour of the day on the Fourth of July and he did convey his enthusiasm and nuanced patriotism. We ended in the first intentional presidential library that held many books of John Quincy Adams as well as some of the remaining books of his father. The last time that I took the tour our guide was not the expert that I had today. What a fun history lesson! Salem is a short ride on the commuter rail from Boston. There are many things to see and do there. Today I visited the Salem Maritime National Historical Site , which is staffed by US Park Rangers. There is a tour of several houses and the Customs House, which I took last year. There is also a replica of an eighteenth century merchant vessel that is docked on Derby wharf. The Friendship replica was built with tourists in mind and it was fun to walk above and below deck. The original ship could hold two hundred tons of cargo. 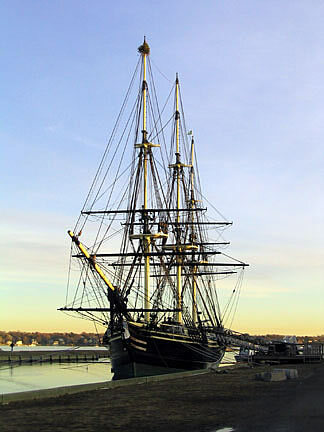 It sailed to many foreign ports buying and selling its cargo to try to maximize profit when it finally returned to Salem. Before Thomas Jefferson enacted the Embargo Act of 1807, Salem had been a very prosperous City. The ships were kept at port for more than a year and it hurt the port cities of the Northeast including Boston and Newport, RI. The president wanted to keep us out of the conflict during the Napoleonic Wars, but the Embargo Act was very short sighted. Many people don't know that the Northeast threatened to secede from the Union decades before the South finally did.